I don't know whether I'm terribly old fashioned or a super-green hippie or what, but I love me a nicely set table with pretty cloth napkins and placemats or a tablecloth. While upholstery samples might get a little bulky for a tablecloth (my mom's quick and easy tablecloth is just two yards of 54" wide fabric with a rolled hem), they make super placemats. 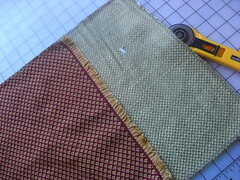 I had some scraps in my pile that were about 12 inches by 24 inches. I used a placemat my sister brought me from Guatemala (that's it, on the left in the photo) as a guide, but about 12 inches by 17-18 inches looks great. Then I used the leftovers to make some pillow covers (info coming later). I went on a sewing retreat with my mom's sewing guild at the beginning of the summer. One of the highlights of the event is a "shop hop" of sorts--exploring all the local fabric stores with other people who also like fabric. While we were out we discovered that everyone has a default project. Mom's friend sees a cute piece of fabric? She pictures a shirt. My mom? She sees tote bags. Me? I see skirts, but I've definitely been influenced by my mom's view. 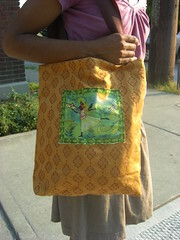 And when you have a stack of upholstery fabric, tote bags are a natural choice. My friend was heading for Africa right after I visited in June, so I appropriated one of the samples, found some ribbon from a gift (look at me recycling! ), and an appropriate piece for embellishment (I'm not sure if you can see, but the woman is petting a giraffe). The tote bag was a good idea. Waiting to start until after I finished another project at 2 a.m. the night before I headed off to see her might not have been.